For my analysis of the language of grief in Charlotte Brontë’s letters (see also my previous blog post), I did a keyword analysis with the help of WordSmith Tools in which I used Jane Austen’s (1775-1817) letters as a reference corpus. One of the results was that very had was a negative key. In other words, Charlotte Brontë used the word relatively little in comparison to the reference corpus. However, another explanation is also possible: the author of the reference corpus uses the word relatively often. Though all this was a bit off topic for my essay, it was still a question that occupied my mind. 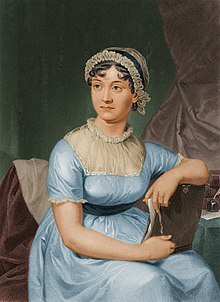 Throughout her letters, Austen used the word very as often as 1,241 times. This frequency ranks it as the 19th most frequently used word in her letters. Strikingly, very is not even one of the hundred most common words in English. The eighteen words that occur more often than very are all among the hundred common ones. The next item that is not among the common words is much. Both much and very are quantifiers. This leads us to the question what this could mean for Jane Austen’s language. Though I categorized some utterances as descriptions of people and others as politeness, they do not mutually exclude one another. Depending on context, I am very, am very much and I was very can all be part of a politeness phrase. All in all, this leads me to conclude that Austen’s frequent use of the word very is part of her means to be very polite in her letters. It would be wrong to assume that this means that Austen used a lot of negative politeness, as the following passage from a letter to her brother Francis (Frank) shows. Austen’s use of very, even in the formulaic I am very much obliged, is meant as a marker of positive politeness toward her brother. In sum, I was right to assume that the fact that very came up as a negative key for Brontë had more to do with Austen’s letters as a reference corpus than with Brontë’s language. This entry was posted in 18th-century letters, 19th-century letters and tagged Charlotte Bronte, Jane Austen, politeness. Bookmark the permalink.